Is Apple planning on giving their MacBooks, iPods and possibly the iPhone a solar powered boost of energy? Doubtful—but we know they have thought about it thanks to a recently published patent for "solar cells on portable devices." 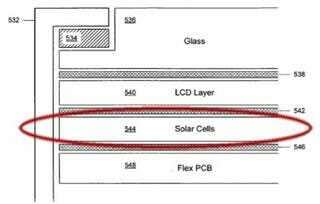 According to the patent, Apple would completely cover a device in a thin layer of solar cells—including the display to maximize the amount of power that the device could harness from the sun.